Because of the inability of erythrocytes (red blood cells) to divide to replenish their numbers, the old ruptured cells must be replaced by totally new cells. They meet their demise because they don’t have the usual specialized intracellular machinery, which controls cell growth and repair, leading to a short life span of 120 days. During intrauterine development, the early stages of life, erythrocytes are produced first by the yolk sac and then by the developing spleen during the third month of gestation, until the bone marrow is formed in the seventh month and takes over erythrocyte production exclusively. There are four major steps in erythropoiesis, which I will explain. Erythrocytes are derived in the red bone marrow from pluripotent stem cells that give rise to all types of blood cells. Myeloid stem cells are partially differentiated cells that give rise to erythrocytes and several other types of blood cells. Nucleated erythroblasts are committed to becoming mature erythrocytes. 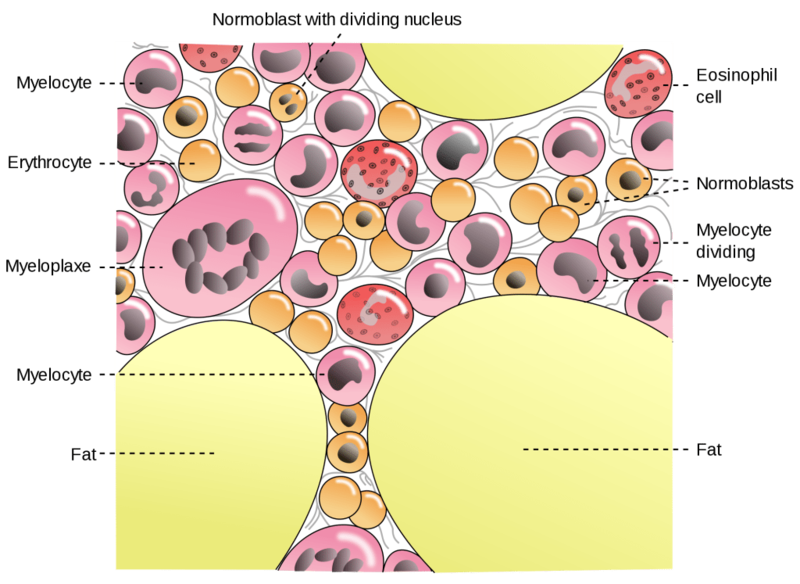 These cells extrude their nucleus and organelles, making more room for hemoglobin. Reticulocytes are immature red blood cells that contain organelle remnants. Mature erythrocytes are released into the capillaries. The pictures in this link and here show the steps of differentiation. Initially, there is a nucleus and as the cell matures the size of the nucleus decreases until it vanishes with the condensation of the chromatin material. Thinking logically you might suspect that because the primary function of erythrocytes is to transport O2 in the blood, the primary stimulus for erythrocyte production is low O2 levels. You would be correct, but low O2 levels do not stimulate erythropoiesis by acting directly on the bone marrow. Instead, it stimulates the kidneys to secrete the hormone erythropoietin into the blood, and this hormone in a domino effect stimulates the bone marrow to produce erythrocytes. Erythropoietin acts on derivatives of undifferentiated cells that have already been committed to becoming red blood cells (RBC’s), stimulating the proliferation and maturation of these cells into mature RBCs. This increase in erythropoietic activity elevates the number of circulating RBCs, thereby raising the O2 carrying capacity of the blood and restoring the delivery of O2 to the body tissues to normal. Once the O2 level in the tissues of the kidneys is brought back to normal, erythropoietin secretion is turned down until it is needed again. This is an example of a negative feedback mechanism.